Private/own entrance and three rooms to yourselves! Off street parking/garden - easy walk to pubs/restaurants. 'A B&B with a difference'. 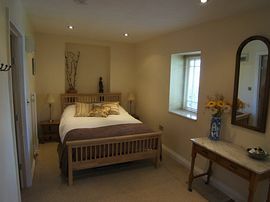 Epworth Annexe B&B consists of a double bedroom with lounge, separate dining room and a luxury shower room. Epworth annexe is very private with its own entrance allowing guests to come and go as they please without disturbance to anyone. 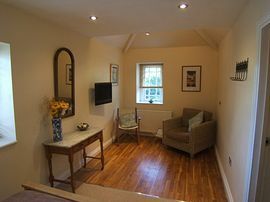 Epworth is ideal for singles/couples, but will accommodate a family of four* (*see below). The accommodation consists of three spacious rooms and includes wifi, flat screen T.V, tea and coffee making facilities, and continental breakfast (cooked breakfast by arrangement). An extra bed(s) can be put out if needed (extra charge). Large double bedroom/sitting room with pocket-sprung double bed, two comfy armchairs (only one pictured) and flat screen TV with Freeview and DVD with free-to-use selection. 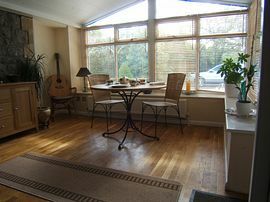 The separate garden dining room is equipped with Internet connection point, fridge, toaster and kettle. 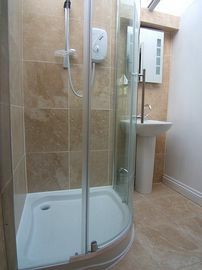 Spacious shower room with large shower, stunning travertine tiles throughout and under floor heating! Cooked breakfast £5.00 (by arrangement only). 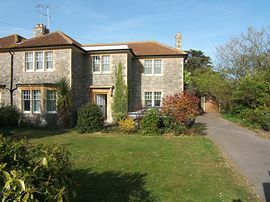 Guests have full use of the large garden and private off street parking. Garage facilities are available for motorcycles and bicycles. Please note that the accommodation is non smoking (smoke alarm installed!). Guests are, of course, free to smoke in the delightful orchard gardens. Banwell offers a good community service with regular buses to Weston-super-Mare where you will find shops, cinemas, the beach and a world famous fish and chip shop! Banwell has many excellent walks and parks with children's areas. For those who want to eat in there is a choice of home delivery Indian, Chinese and pizza. The Post office, newsagent and general store are located on the village main street. Just up the road is Court Farm, a children's attraction where they can feed the animals and enjoy the adventure park. Worle golf course and driving range are just two minutes away along with a dry ski slope, pony trekking clubs, fishing (two major lakes) and a well established paint balling park. By car you are only 15 minutes away from the famous village of Cheddar where the Cheddar caves and gorge are found. 25 minutes away is Wookey Hole caves-a great day out for the family and the city of Wells with its famous cathedral and Bishops Palace. 30 minutes away is Glastonbury and Tor and the beautiful city of Bath is only 45 minutes away. Extra bed: £5.00 per night. Cooked breakfast: £4.00 (by prior arrangement only). Pet Facilities: Pets are allowed. Dogs welcome - watch out, though, for our springer spaniel! 2.5 miles from J21 of M5. 10 minutes drive to Weston super Mare.